Summary (from Goodreads): When her older sister commits suicide and her divorcing parents decide to divide the ashes, Harper Scott takes her sister's urn to the one place June always wanted to go: California. 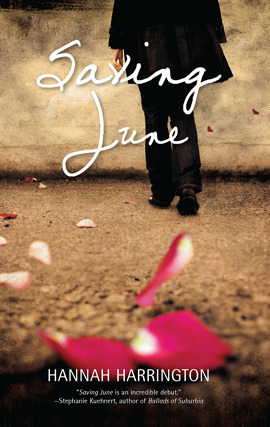 On the road with her best friend, plus an intriguing guy with a mysterious connection to June, Harper discovers truths about her sister, herself and life. My Summary: Harper and her sister have always been complete opposites, neither one understanding much about the other - until June commits suicide in the family garage, and Harper is the first to find her sister's body. Harper was never close to her sister, but in the weeks following June's suicide, all she can focus on is trying to figure out why her perfect sister would chose to end her life. When a CD is found in her sister's car radio with a mysterious inscription, Harper tries to decode the meaning and ends up meeting a guy who knew June better than anyone else. Together they set out for California - a place where June always dreamed of going - to spread her ashes and ensure her enigma of a sister is finally at peace. My Thoughts: It's not often that a book catches me by surprise like this one did, but when it happens, I'm always thankful that I chose to read it. Saving June was one of those contemporary lit books that's just so realistic and heartbreaking that you know something like it has happened to someone, somewhere. The extremely realistic aspects of the novel made it so easy to relate to that I felt like I had become good friends with Harper (the main character) before the half-way mark: she was strong and sharp-witted and just all-around likable. Final Thoughts: I recommend this novel to anyone who's a fan of contemporary literature or anyone who wants to give the genre a try. Check it out!